My experiments in the last few days have resulted in mixed — but encouraging — results, and as promised I am sharing them with you. The process is self-contained. EvoCam acts as the file converter and the FTP client. 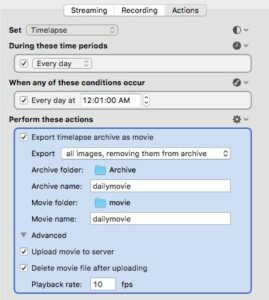 I already use the FTP settings in the software to upload the still images, so when the time lapse movie is created by EvoCam, it easily uploads it to this website without having to use a third party FTP client. Control over the frames per second (FPS) settings. With the current process, I have no control over the frames per second, meaning that the speed of the daily video is going to be 30fps. With the EvoCam settings I can decide just how fast the individual frames are displayed in the finished product. I have been experimenting with frame rates as low as 5, and as high as 15. The results are pleasing. By slowing the video down, I make for a longer watching experience. This wouldn’t be an issue if most of the videos — especially in winter! — weren’t complete darkness; however, since making the adjustments to the white balance settings, that is the case. The solution to this, so far, has been to use EvoCam’s light detection feature. Each video starts just around daybreak, and ends just after sunset. The drawback, is that any celestial movements such as the moon or bright stars are missed. File size concerns. I would love to include the night time hours for the reasons above. Slowing down the time between images in the video means the video’s file size may get to the point where I lose a portion of my (already very small) audience. The experiments with daytime-only videos are resulting in videos that are of a manageable size, but that is also a result of using stills taken 60 seconds apart as opposed to the 30 second intervals I currently use. More images, and slowing things down could mean a much more bloated final video. I have the bandwidth thanks to my awesome ISP (also my employer), but many of my neighbors either have slow DSL or services such as satellite with bandwidth caps. 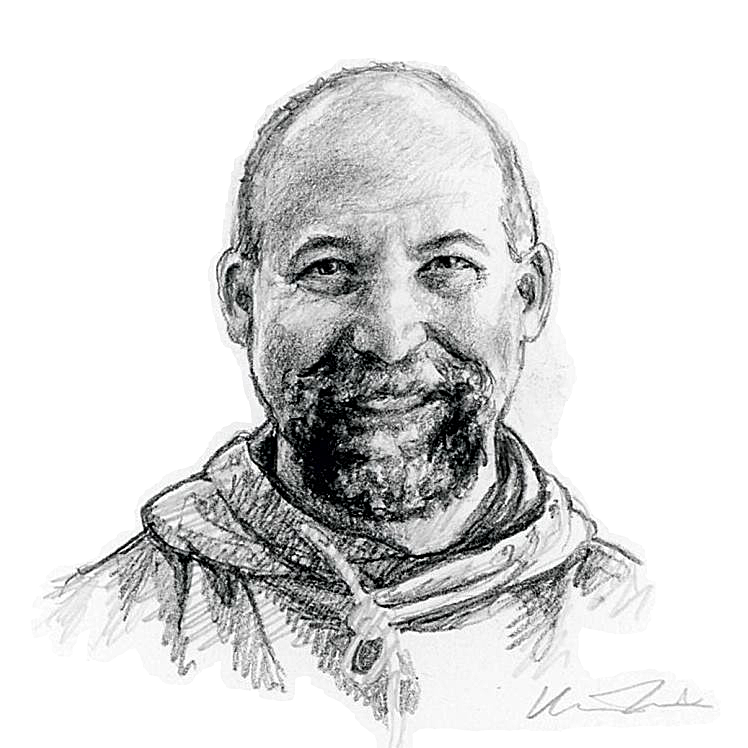 One the most frustrating thing about all this is that EvoCam’s developer disappeared without a trace over a year ago, and I worry about the future of my little hobby. I have been unable to find similar software that does half of the things that I want, nay, need for my projects. For the time being the software is stable, but I wish that someone would be willing and able to take it over if the former developer is done with it. If you know how this can be accomplished, please do hit me up. For now, my experiments continue. I still have a few things I need to investigate. For example, I am not sure how to control archiving or names of the files. I am fine if the local files are simply sequential (i.e., daily-1.mp4, daily-2.mp4) because I will have the creation dates to let me know the date of the footage. I like to review the videos to see if they contain anything funny, unusual, or unique. But, I need the uploaded file to always be the same (daily.mp4) so that I don’t have to adjust the HTML. Based on the results when the “delete movie …” setting is enabled, I assume this will be the case; however, as usual, I just thought of this whilst I was typing the paragraph above. As I said in the opening of this entry, there are some benefits and drawbacks to both methods. The great news is I don’t really have to choose. The current method is hacked together, but it is working (knock wood). And I can continue to run my experiments without them getting in the way of the other method. Right now it is looking promising that I can stop running the previous method, and do all of the things above within EvoCam. If I do, you’ll be the first to know. 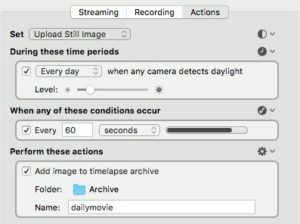 Found out that if one does not check “delete movie…” EvoCam saves only one instance of the resulting video, overwriting the previous day. 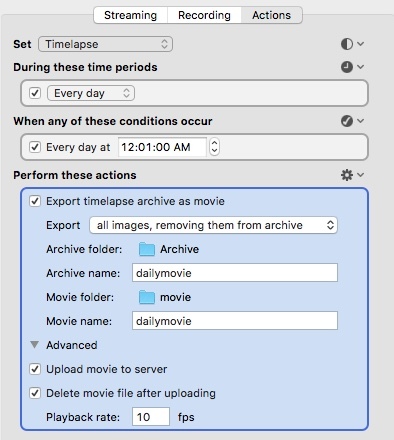 This is far from a setback; my quick solution was to create a three-step Automator workflow to rename the video file each day, and move the file to a local archive directory. However, if this is to be a viable replacement from my hacked method, I will need to figure out what time to stop the EvoCam video, and what time to run the cronjob for the archiving workflow. This isn’t an issue with my test model as I am only recording during daylight hours. But if I want the video to run from as close to 00:00:00 to 23:59:59 as possible, then I need to time things properly. EvoCam needs to export the video to the local folder, upload the file via its built-in FTP. Then the cronjob needs to run an upload the resulting video before the new video is created. Never mind, the above is all wrong! The way EvoCam works is it hold the images for the new day’s video until it is time to make the video. Therefore, it I don’t need to time when I run the cronjob. I feel silly now.